Check out Xur’s wares this week. Exotic vendor Xur has returned to the Reef in Bungie’s Destiny, hawking some familiar looking wares. Find the open door off to the right as you enter the Vestian Outpost where he will remain until July 3rd, 2 AM PST. This week, Xur is carrying the Twilight Garrison (Titan chest), Mask of the Third Man (Hunter helm) and Apotheosis Veil (Warlock helm), each for 13 Strange Coins. 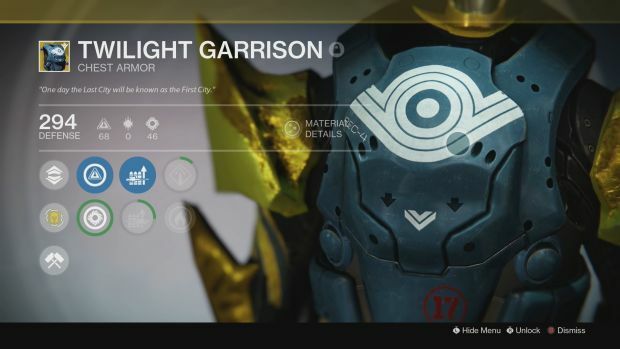 The Twilight Garrison is obviously the biggest attraction here and while it’s been nerfed to allow a short cooldown between dodges, it’s still recommended for Titans. The Legacy Engram this week is actually for helms and they cost 29 Strange Coins so it’s also possible to pick up Mask of the Third Man and Apotheosis Veil from this but they will be at Year One levels. The Exotic weapon this week is Bad Juju, a pulse rifle that deals increased damage and reloads its magazine automatically as you stack up kills. Kills will also result in increased Super energy. At 23 Strange Coins, it’s not a bad deal.